Canadians pride themselves on tolerating, even celebrating, the multitude of cultures in our land. We are a country of immigrants, none of us here longer than 450 years (except Aboriginals, of course). Many are new arrivals- Canada welcomes 225,000 – 275,000 newcomers a year. In a country with a population of only 35 ½ million, the new arrivals have significant impact. Newcomers add their culture to the ever-changing Canadian reality. Italian, Chinese, Polish, Indian, Lebanese communities are Canadian, no doubt. The Somali community has become stronger in recent years developing their own community centres and teaching the rest of us about their ways. In Ottawa, Afghani restaurants have appeared in the last 5 years. For me, it’s when the restaurants start sprouting up that I feel an ethnic group is really flourishing in Canada’s tolerant atmosphere. Of course it’s more than atmosphere- laws, rights and freedoms assure every Canadian the right to speak and worship, congregate and live in their own way. An Ontario judge recently upheld the right of an Aboriginal parent to use traditional First Nations medicines to heal her sick child, rather than the poison called chemotherapy. By doing so, precedent has been set: mainstream allopathic medicine is not the only legitimate medical model. We have the right in Canada to follow our own values, beliefs and traditions. So now we come the crux of the matter: individual decisions and attitudes that are, human nature being what it is, sometimes less tolerant than the country’s laws.Quebec has been experiencing charges of racism over its proposed “values charter” that would restrict religious clothing. The federal government vows it would fight such a move. Read more. Recently mosques have been defaced in Trois Rivieres, Quebec and Cold Lake, Alberta. In Nova Scotia, a grandmother was charged with assault and criminal harassment after attacking a woman for wearing a headscarf at a mall. Read more. These behaviours are illegal certainly, but what about the attitudes, words and quiet decisions made by individuals every day? Tolerance is one thing, but let’s go a step further and talk about accommodating people’s beliefs and cultural practices. Many workplaces allow their employees to celebrate their religious holidays (with pay) regardless of how they line up with traditional Christian holidays. So, Muslims, Buddhists and Hindus get Christmas and Easter off because their workplace is simply not open on those days- they are statutory holidays. They may get Eid or Diwali off as well. I’ve heard Christians complain about that- even calling it discrimination. “Why does a Hindu get more holidays than I do?” Is there a solution to this? How about calling them Personal Days and letting everyone take them off at their discretion? As Muslims become a larger part of our population, they may demand their holy day, Friday, off, yet be willing to work Sunday. Can employers accommodate this? Well, a retail store can, a factory can, but an institution like the federal government or a school board cannot. Airports have prayer rooms; many schools and workplaces have prayer rooms or “quiet” rooms as well. This accommodates some Muslims who have made a religious commitment to pray 5 times a day. My school has such a room and it’s used by more than Muslims. I often go in there at break time, sitting cross-legged and meditating. Sometimes a student will ask what I’m doing. I explain, “I am praying. My prayer looks like this.” The student will smile or touch me in solidarity. We seem to agree in the secluded serene space: all prayer is good. We have female students who are completely covered with a niqab. Not all coverings are the same- see the many styles and traditions here. 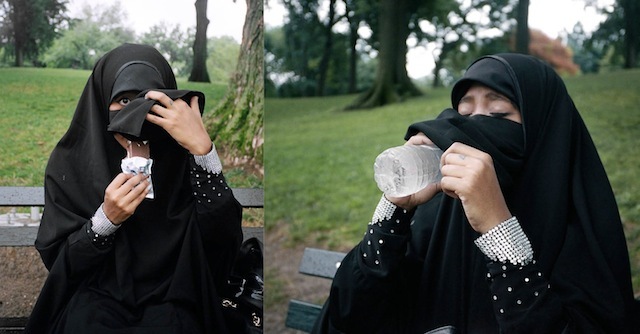 The women wearing a niqab have difficulty eating at lunch time. Our school has several classrooms used as lunch rooms and a kitchen area as well. All are coed. For such women, they cannot lift the niqab to eat in the presence of men. I’ve seen them furtively slip a spoonful of food under the covering into their mouths. I’m also aware of them missing meals because they couldn’t eat with men in the room. I think it is vital that we examine every decision we make, no matter how small, for judgement. I firmly believe it is not my place to judge another’s beliefs or practices as long as they are not illegal, harmful to self or others. These women wear the niqab and it is not a decision that requires changing, enlightening or educating. It is a simple fact- their reality. For us to make it difficult for them or to refuse to make life easier for them imposes our beliefs on them. Do we have the right to do that? Yes, of course we do- it doesn’t impinge on their human rights. Is it fair? That’s a whole other question. So we have come to an impasse. Some of the staff would like to accommodate the women; some think it is a mistake. You know, to me, we are not in Rome. We are not in Turkey. We are in Canada- and Canada values holding onto one’s culture and tolerating differences. More than that- we are known to be a people who will go out of our way to be kind. We have a reputation for compassion. As well, our students are new arrivals, the majority in the last year or two. They are constantly adapting to their adopted country; the new smells, sights and weather are all stressful on the body and brain. On top of that, the shopping, the food, the cultural expectations- everything from being at school on time to the way they discipline their children, from being spoken to by a male at the bus stop to dressing properly for winter- they are all stressful adjustments. We are a democracy at our school, but we have not been able to come to a consensus, and so leadership is required. I am the manager. The women will have the option of a lunchroom for their use alone. It will be discreet- not a designated room with a sign- just a quiet out-of-the-way place where a few women can find some privacy to eat in comfort. It’s almost the least we can do.